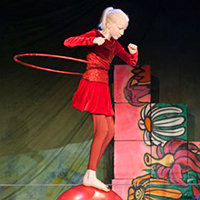 The Elf School is an ambitious circus school and its pupils learn a wide range of circus skills: floor, pair and pyramid acrobatics, balancing acts, juggling and theatrical expression. The school caters for adults down to children as young as 1. Every spring there is an end-of-term party where the students get to perform with full costumes and stage sets. The spring party is held on the Hurjaruuth stage. The Elf school head teacher is circus artist, clown and experienced teacher Celso de la Molina. On Mondays the teacher is circus artist, aerialist Haidi Sadonkorpi.